By combining a few photos and giving them a lovely soft oval vignette, you'll wind up with a totally new work of art. One of the many superpowers of image editing apps that support layers is the ability to combine images into a collage. In this column, you’ll learn to create the ever-popular, oh-so-romantic, soft oval vignette collage in Adobe Photoshop, Photoshop Elements, and Pixelmator. (Sorry, you can’t do this workflow in Adobe Photoshop Lightroom or Apple’s Photos, iPhoto, or Aperture.) This technique is perhaps the easiest—and most romantic—way to combine two images into a new and unique piece of art. To get started, you’ll need to open two images and combine them into the same document. In any of the three apps, open two images (in Elements, make sure you’re in Expert or Full Edit mode). Activate the document that contains the soon-to-vignetted photo and then press Command-A to select it. Press Command-C to copy it to your Mac’s memory and then activate the other document and press Command-V to paste the copied image. When you do, the image lands on its very own layer. Make sure the new layer lives at the top of the layer stack (just drag it to the top if necessary). Here you can see the Layers panel in Photoshop, Elements, and Pixelmator (respectively), with each image of the collage on separate layers. From the Tools panel, grab the Elliptical Marquee tool. 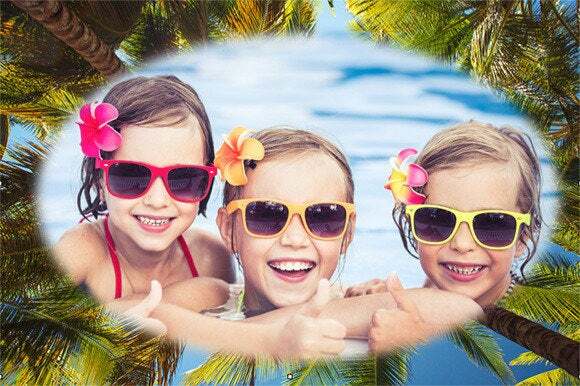 Peek at your Layers panel to make sure the correct image layer is active (the girls), and then—in the main document window—position your cursor near the center of the image. Press and hold the Option key, and then drag to draw an oval-shaped selection from the inside out. 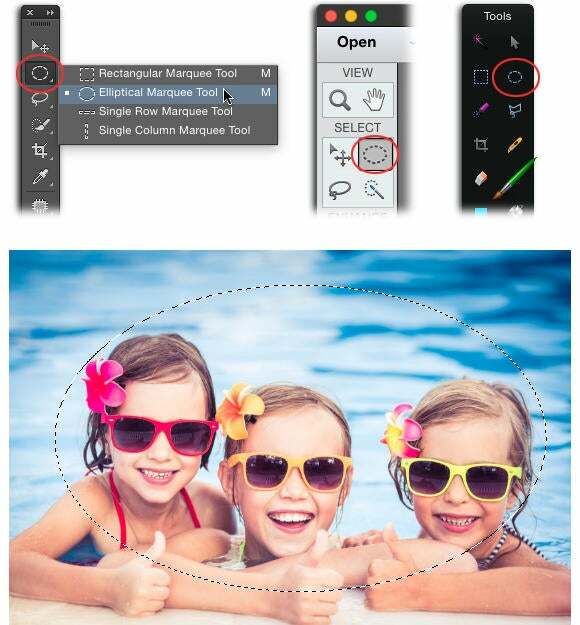 Top: The Elliptical Marquee tool for each app is circled here in Photoshop, Elements, and Pixelmator (respectively). Bottom: Once you grab the tool, drag to draw a selection atop your image, like the one shown here. Try not to get the selection too close to the image’s edges. To reposition the oval selection while you’re drawing it (meaning you haven’t let go of your mouse button yet), press and hold the spacebar and drag with your mouse. When you’ve got the selection just right, release the Option key and your mouse button. In Elements, click Refine Edge in the Options bar at the bottom of the workspace. In Pixelmator, choose Edit > Refine Selection. 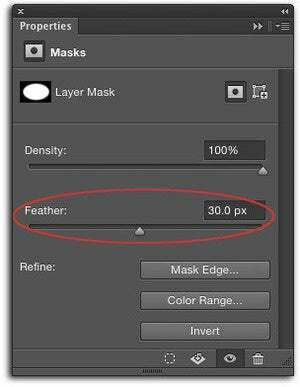 In Photoshop, just hang tight—we’ll feather the mask (instead of the selection) in a minute. In the resulting dialog box, drag the Feather slider rightward until the feather preview looks good to you. In Elements, choose Selection from the menu at the bottom of the dialog box, and then click OK in both apps. To see a preview of the feathering before you commit to it, use the Refine Edge command in both Elements (left) and Pixelmator (right). Hide the area outside the selection with a layer mask. You could inverse the selection and then delete the area outside it, but that’d be mighty reckless. What if you changed your mind? You’d have to undo several steps or start over completely. A less destructive and more flexible approach is to hide the area outside the selection with a layer mask. To add a mask in Photoshop and Elements, locate the Layers panel and then click the circle-within-a-square icon (it’s at the bottom of the panel in Photoshop and at the top of the panel in Elements). 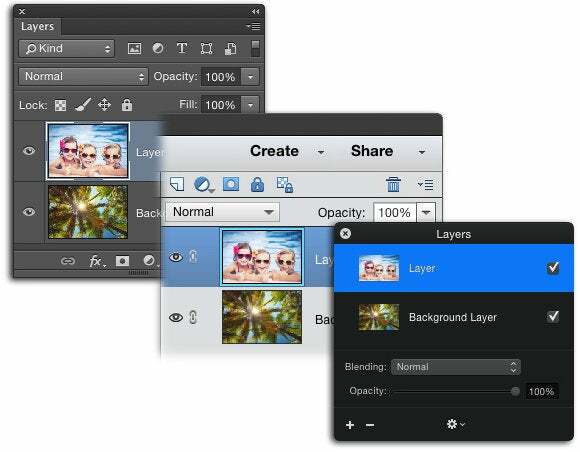 In Pixelmator, click the gear icon at the bottom of the Layers panel and choose Add Layer Mask from the resulting menu. Get rid of the selection by pressing Command-D in all three apps. 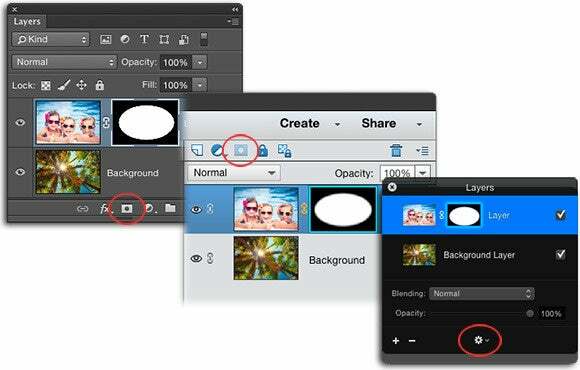 Click the buttons circled here to add a layer mask in Photoshop, Elements, and Pixelmator (respectively). You could add a layer mask using the “Output To” menu in Elements’ Refine Edge dialog box, but it’s good to know how to add one using the Layers panel, too. Now let’s feather the mask in Photoshop. In the Layers panel, double-click the mask—the black and white thumbnail next to the image thumbnail—and the Properties panel opens. 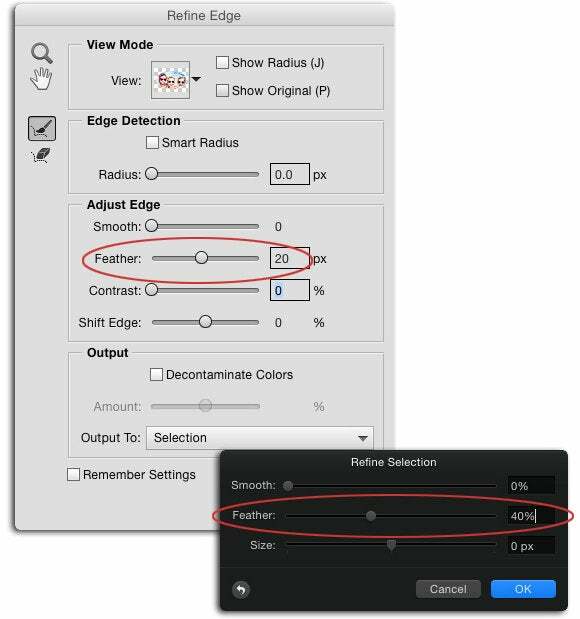 Drag the Feather slider to the right and Photoshop softens the selection right before your eyes. To alter the feather amount later on, just double-click the mask to reopen the Properties panel. Last but not least, you can use the Move tool in each app to scoot the vignetted image around in the collage. Photoshop is the only one that can feather a mask in this way, which is handy for experimenting with feather amount after you save and close the document. In Photoshop or Elements, choose File > Save As to save a master document for further editing, and then pick Photoshop as the format so your layers are preserved. In Pixelmator, choose File > Save. To make a copy of the image you can send to someone else or post on the web, choose File > Save for Web in Photoshop or Elements, or choose File > Export in Pixelmator. Choose JPEG from the resulting dialog box. As you can see, this technique makes for a super cute piece of art! Until the next time, may the creative force be with you all.